My morning began with a small intimate gathering of about 25 of the Britannia Basketball Program’s High School aged girls. Mark created a conversation where we discussed a wide variety of topics. From my basketball journey and how I got started, to the challenges I faced, my love of art, creative expression, playing at an elite level, the numerous opportunities basketball has afforded me and so much more. After our discussion, we opened it up for questions and these young ladies did not hold back. They asked great questions about time management, building confidence, making time for all their passions, what it takes to play at the next level and so on. This was an incredibly bright group of young girls. There were two specific moments that stood out to me. The first was when, if I remember correctly, her name was Ciara, expressed her love for fashion and how she is already sewing and creating her own designs! That resonated with me because I remember when I was her age, playing basketball and taking art and fashion classes. I could see her passion because her eyes lit up as she was taking. I wouldn’t be surprised if a few years down the road she is doing her thing in the fashion industry! Excited to see what the future holds for all these young ladies! Photo courtesy of NBA Canada. The second moment, was when the Coach shared how one of her girls, named Surprise, was going through a tough time. So to encourage her, she was looking up positive quotes and verses for her. She came across an illustration of a natural hair girl holding a basketball and a bible. The quote attached read, “Your talent is God’s gift to you, what you do with it is your gift to God.” She had stumbled upon my website and the illustration was my logo for K. Alexander Creations! You guys, say what you want but I believe God works in mysterious ways! The fact that she would stumble on my website, to later being in the same room having a conversation? You can’t tell me God did not orchestrate that! I was happy that through sharing my talent, passion and love of Christ, I was able to have a positive affect on Surprise. Meeting and having a conversation with her, was definitely a highlight for me. I also want to use this as an opportunity to encourage you, if you have a talent, a struggle you overcame, etc, share it! You never know who you will help because of it. After the Q&A I was able to have more one on one conversations with the young girls, get to know them, hear their stories, their interests and engage with them on a personal level. They were all super sweet and I am excited to see what the future has in store for each and every one of them. Coach Mitra Tshan, Myself and Mark Starkey. Photo courtesy of NBA Canada. Lastly, I was able to have a conversation with their coach, Mitra Tshan. I want to have a moment to just recognize her and all she does for the youth in her community. From helping to set up opportunities like this, to helping out with numerous basketball programs and teams in her community, giving the kids cool experiences, like organizing her USA tournaments in the summer around a WNBA game so that her girls can experience it live, and dream of being in that position one day, to teaching the girls important life skills through basketball that they will cary with them for a life time. Coaches, especially at the grassroots and younger levels don’t always get the credit they deserve. So I just wanted to spot light her and thank her for what she does in her community. It makes a lasting impact. I know this because I still remember the two coaches who gave me my first shot at basketball, and taught me life skills along the way. Coach Monique Kovacs and Keith Macey. Later that afternoon I participated in the Sponsorship Marketing Council Canada Panel discussion. The panelist included: Dan MacKenzie, Vice President & Managing Director NBA Canada, Mark Starkey, Managing Partner & Chief Executive Officer Victory Creative, and John Mills, Richmond Olympic Oval and Co-Chair of the Board of Directors Canada Basketball. 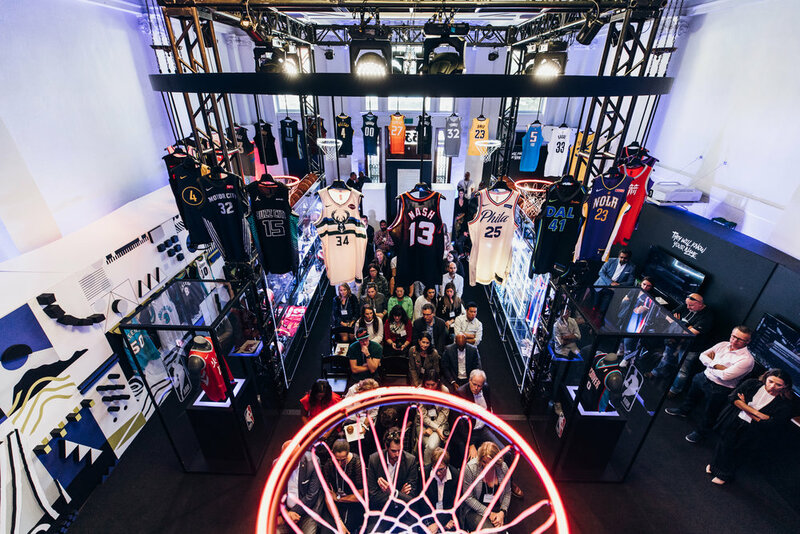 The theme of the panel was “This Is Why They Play’, The polarization of the Canadian basketball industry and how brands are working to harness this growing consumer passion point. It was a very informative, interesting and educational discussion. Although I myself was a panelist, I learned quite a bit! Panelist: Mark Starkey, Dan MacKenzie, myself, and John Mills. Photo courtesy of NBA Canada. NBA Crossover space, SMCC Luncheon Panel. Photo courtesy of NBA Canada. To conclude, the evening consisted of exploring the NBA Crossover space! I will let you experience the space for yourself through all the pictures. In order to get into NBA Crossover you had to register online, that granted you free admittance. If you like what you see and are in the Montreal area October 6th and 7th I would highly recommend that you check out the space! You can register for the Montreal NBA Crossover here! Want to know how my final day in Vancouver for the NBA Canada Series went, check out Part 3! All photos courtesy of NBA Canada. Newer PostNBA Canada Series Part 3- GAME DAY!